Issue #1: I'm creating custom images for the menu selection of my game. They're saved in non-interlaced PNG format. Dimensions are 280x48. The problem is, when I run them through WiiBuilder 1.0 to convert them to *.h files, it gives me the message: Warning: not a multiple of 4. If I add the image.h file to my DevKitPro project, it will compile, but when I run the game, the new images just come out as garbled pixels. Anyone know how to fix this? 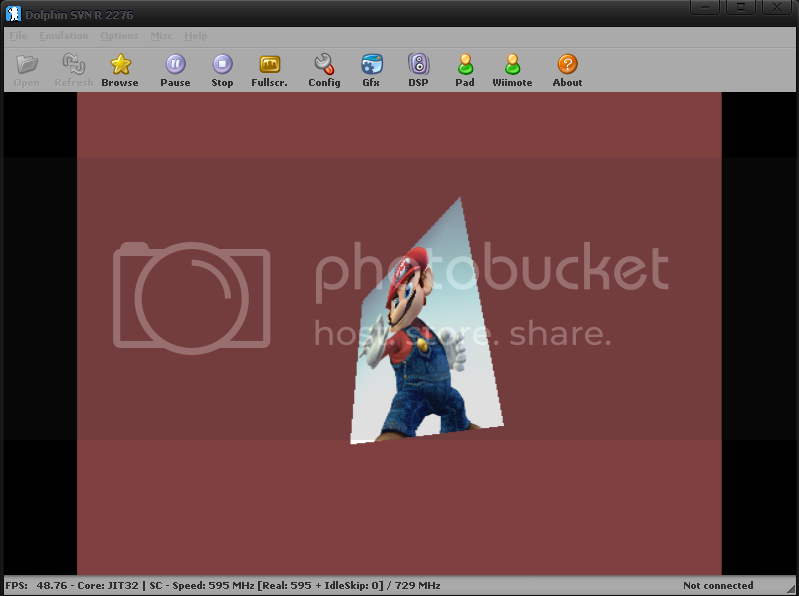 Issue #2: In an attempt to make a quick and easy way to fade images in and out (for splash/menu purposes), I made some modifications to my v3.0 GRRLIB.c and GRRLIB.h files. My problem is, the Splash image only stays on the screen for approx 1-3 seconds before it loads the main title screen and menu buttons. Is there a way to display the splash for maybe 5 seconds total time before changing to the title screen? It's just changing too fast. I tried changing my speed variable from 1 to say 0.5, but when I do this, it doesn't load the image at all. Issue #1: Are you really sure the width and height of your image is 280x48? Because if WiiBuilder is reporting this warning that's strange and the effect on the screen seems like the size not being a multiple of 4. Thanks for the help, Crayon. The warning I was getting in WiiBuilder has been fixed. I just had to redo my images until their dimensions were multiples of 4. So they're working now. The fade is apparently alot slower when viewed on the actual Wii, as opposed to testing it in the Dolphin emulator. There's really nothing special to it. I probably forgot to mention you have no input control, unless you're using an XBOX360 pad, in which case I've not tested, cus I'm not cool enough to own a 360. Really, the only thing I use Dolphin for is to make sure a project will even load. Makes it easier/faster when testing something or trying out tutorials. Other than that, I've noticed I have better luck loading GRRLIB stuff when using Dolphin_r2276 instead of Dolphin_r2630. I uploaded a copy of the version I use, if anyone wants it (link below). One other thing, sometimes you'll get an error when loading a .dol that says: Failed to grab 1 GB of contiguous memory! Don't worry about it, just reload Dolphin and load your .dol again and it should be fine. The screenshot below was taken after compiling the xane01 example source that comes with GRRLIB 4.0, then ran in Dolphin_r2276. Below the screenshot is a link to download Dolphin from my megaupload.